Desolation is never far from the work of producer James Blake. Over the course of two albums – his self-titled debut and the Mercury Prize winning Overgrown – Blake has forged an art making post-dubstep electronica that’s sparse and often wistfully frail. Even when recently collaborating with noted powerhouse Beyoncé, he brought minimal piano tones and his own quivering voice to the table. It’s therefore unsurprising that on his latest effort, The Colour In Anything, Blake doesn’t venture too far out of his comfort zone, despite writing credits from Frank Ocean and production by Rick Rubin. If you’re not already a fan of Blake, then there’s little here that will convert you. Even the impossibly stretched out, droning synth that punctuates opener ‘Radio Silence’ will definitely seem eerily similar to the ones used on ‘Retrograde’ and ‘Digital Lion’ three years ago. For Blake fans, The Colour in Anything builds on his debut and Overgrown while also seeing the producer edging closer to maximalism, using heartbreak as an emotional foundation. On ‘Points’ in particular, the glitch-ridden, chopped and skewed repetition of the line “no longer her” over a deep bassline and muted klaxon echoes some of Blake’s earliest work, while ‘Love Me in Whatever Way’ mixes melancholic piano with a pulsing, synthetic heartbeat and a typically emotionally wrought vocals. The single ‘Modern Soul’ could have been taken straight from Overgrown due to its delicate balance of piano leitmotifs, beats and electronics. However, it’s also a record that sees him experimenting a little more with his musical palette while still holding on to his sonic motifs. ‘Timeless’ contains the chopped voices and vocal effects but also introduces an incredibly creepy synth melody that gradually ramps up in intensity across the course of four minutes. On ‘I Hope My Life,’ Blake creates one of his most club-ready tunes thanks to its skittering percussion and harsh waterfall synth line (it is the ‘1-800 Mix’ after all), though it’s tempered with Blake’s typically wistful voice and some seriously dark undertones; this is where listening to The Colour in Anything through headphones at 3am is a seriously good idea. The glacial synths and hazy, layered beats on ‘Put That Away And Talk To Me’ are reminiscent of the sparsest moments on Björk’s Vespertine, placing in full view the inherent fragility that’s always been a part of Blake’s work. Bon Iver’s Justin Vernon makes a guest appearance on ‘I Need A Forest Fire,’ where the very delicate melody is peppered by a trap beat. The pair play off against each other well, though this is hardly surprising; they are essentially two sides of the same coin. Underneath the effects, though, this is also Blake’s most personal record to date, both lyrically and musically. The simplicity of piano ballads ‘F.O.R.E.V.E.R’ and ‘The Colour in Anything’ lay Blake’s emotions bare, revealing a damaged soul. ‘Waves Know Shores’ is given a powerfully emotive edge thanks to its electronic brass and smattering of harmonies, and while ‘My Willing Heart’ begins with incredibly minimal percussion, it soon develops into an agonising blend of muted brass, piano and synths that masquerade almost perfectly as strings. Somewhat curiously, ‘Choose Me’ is simultaneously the poppiest moment on the LP, while also being one of its rawest cuts. Beginning with haunting gospel-inspired melodies, it soon descends into a flurry of distorted vocal effects, swirling electronica and hip hop beats. It’s Blake himself that lends the track its intensity. When he wretchedly howls and desperately sings lines like “you don’t weigh me down like you think you do,” he strains his voice to its absolute limits and often sounds on the verge of breaking down. With all this overflowing emotion, and standing at seventeen tracks long (that’s over an hour and twenty minutes), The Colour in Anything could easily be accused of being overly self-indulgent. If there’s anything that Drake’s latest effort Views proved, it’s that quantity doesn’t always equal quality but despite its very hefty run time, there’s surprisingly few moments that misfire. Still, there are moments when you feel Blake could have been more brutal when it came to compiling the album. ‘Two Men Down,’ for instance, is a sonically interesting track that continually veers between maximalism and minimalism but its odd, semi-experimental edge just doesn’t fit with the overall tone of the album. Meanwhile, closer ‘Meet You in the Maze’ utilises too many vocal effects to feel like an emotionally satisfying conclusion. ‘Noise Above Our Heads’ is perhaps the only true misstep on the record, feeling every bit of its five minutes thanks to uninspired production and the nagging sense that Blake is just going through the motions. The Colour in Anything is already a desolate, tough listen and its sheer scale doesn’t make things easy for the casual listener. 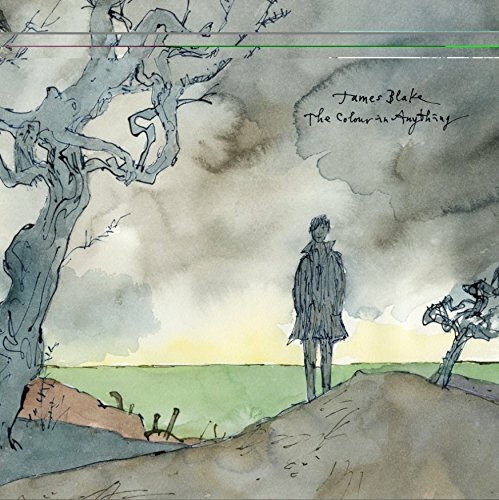 It demands that you sit down and really listen to the record in all its glorious misery but it’s also dusted with the kind of magic you could only find on a James Blake record. He’s an artist that continues to occupy a static void of unwavering despair but can still produce a wealth of beautifully understated treasures. It’s up to the listener to discover whether they have the willpower to take that journey with him.